Old Havana at night is mostly about the bars. And we tried most of them. 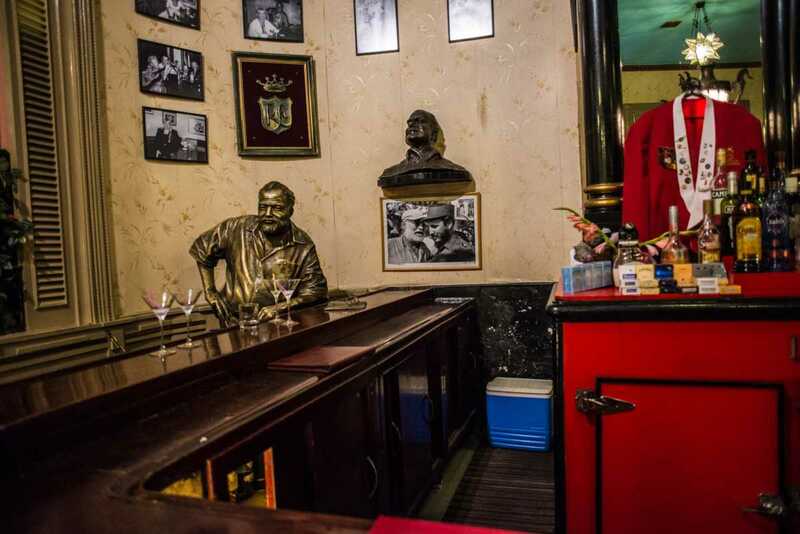 But, although they are mostly populated by tourists, the two “Hemingway” bars, La Floridita and Bodeguita del Medio, are worth the hype. Here you see Papa hasn’t yet given up his seat at La Floridita, his favorite place for a daiquiri. 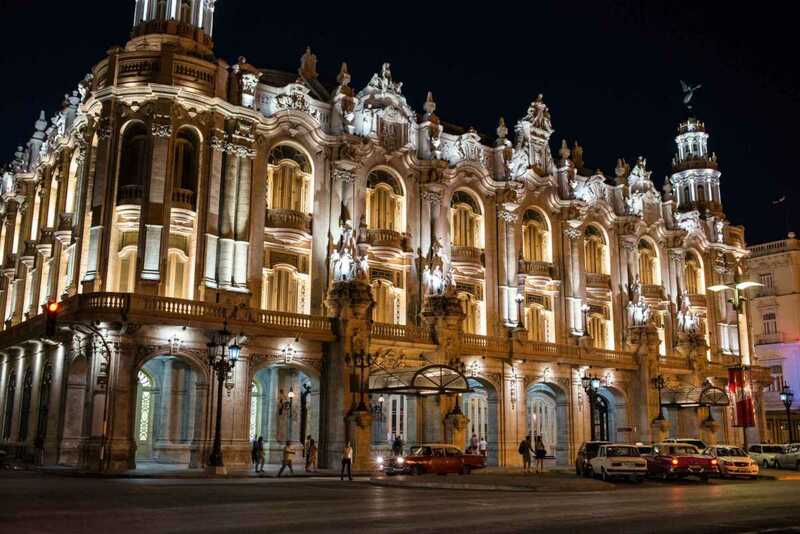 Havana is best seen by night. Not that it isn’t interesting in the sun, too. But at night the colors are more saturated. The music coming out of every bar door has a bounce you can’t deny. And, there’s rum. Mojitos, daiquiris, and shots of dark Havana Club Añejo, all chased with a strong Bucanero beer. Luckily there are plenty of 1950s American cabs for the ride home. 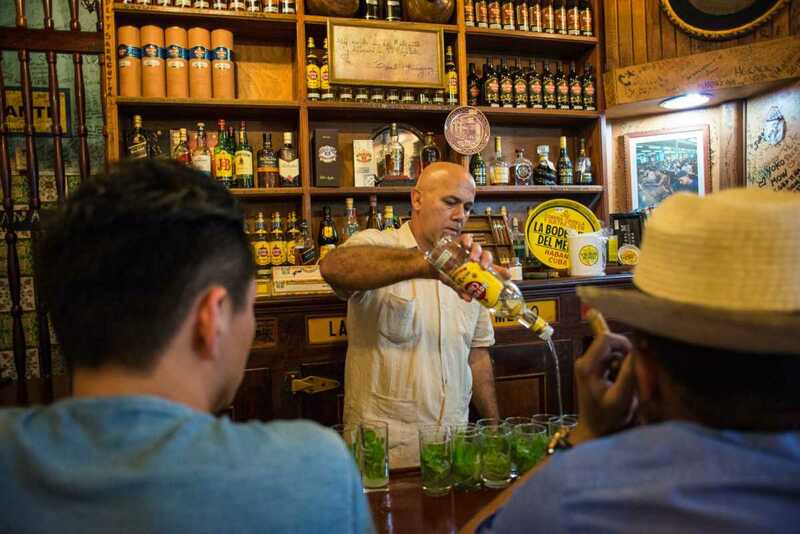 Making mojitos by the dozen at Bodeguita del Medio, which is where Hemingway used to drink them. When he wasn’t drinking daiquiris at the Bar Floridita. They were expensive at $5, but they were by far the best mojitos we had in Havana. They take the care here to do them right. Waiting for a drink at the Cafe Paris and listening to a hot jazz band. We had to drink Heineken because they were out of the national brands. We were told that is frequently the case, as the limited supplies of the two national beers, Bucanero and Crystal, go to the bars that cater to tourists. Outside the Cafe Paris, this guy grooved on his own to the funky rhythms emanating from the band inside. We ran into this rather odd presentation of the Somos Cuba (We Are Cuba) restaurant unfortunately just after we’d eaten somewhere else. This place has a great reputation. We’ll catch it next time. 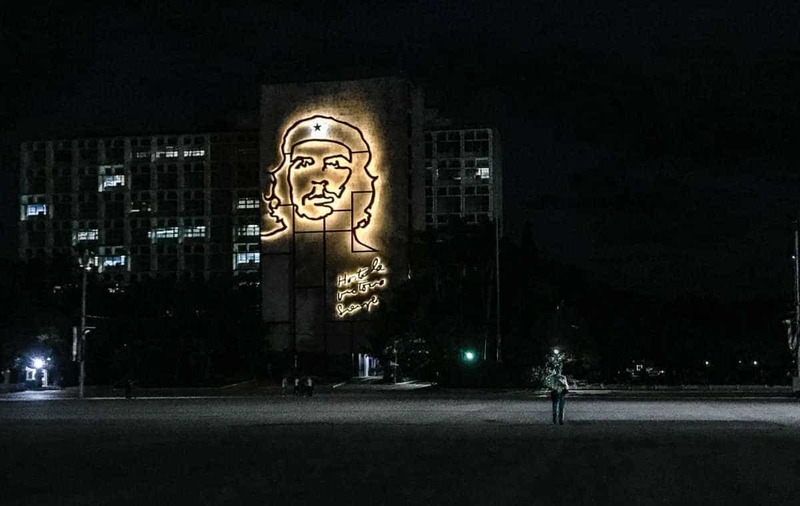 Two of the buildings which flank the Plaza of the Revolution in Havana sport lit metal sculptures of two of the heroes of the struggle. 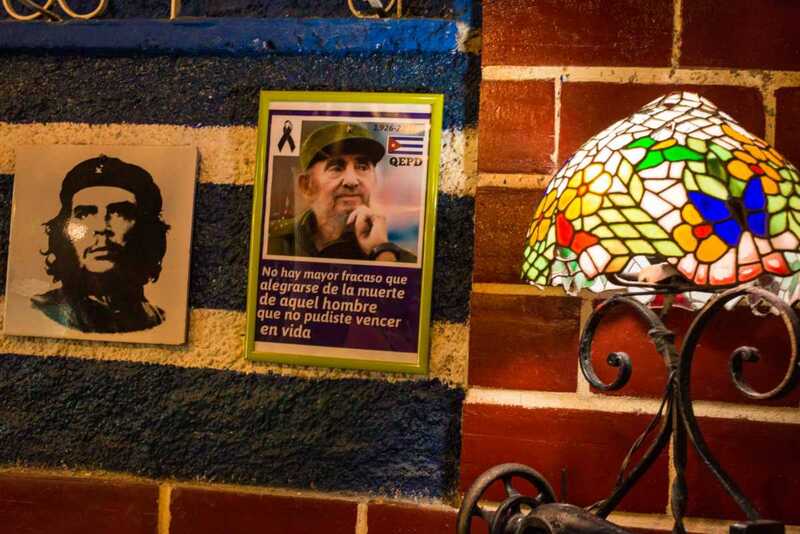 This one, of course, is Che Guevara, with his signature slogan: Hasta La Victoria Siempre, Always Towards Victory. On the other building is Camilo Cienfuegos. His caption is Vas Bien, Fidel. You’re going good, Fidel. At dusk, on the Calle Mercaderes in Old Havana. I just liked the colors, and that it’s a pedestrian street. As are most in Old Havana. Better for the tourists. 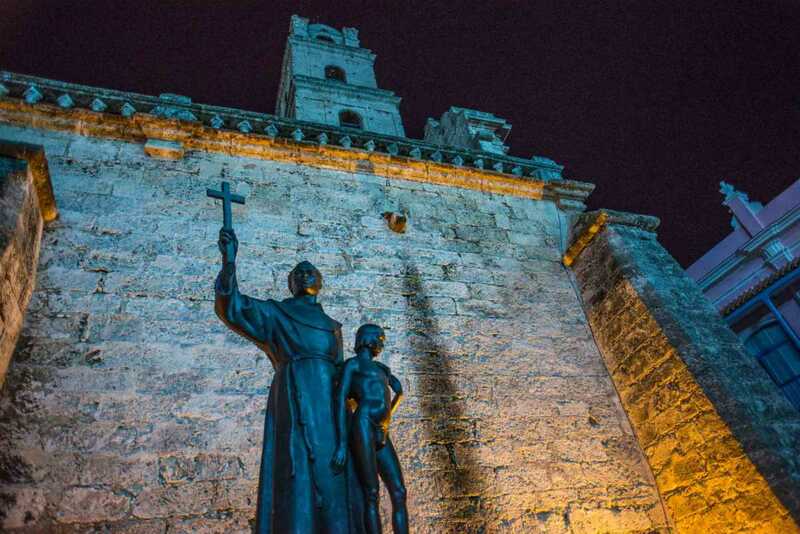 We were always slightly surprised to see religion on open display in Cuba. It’s only been relatively recently that it’s been condoned. This is a nice statue of St. Francis of Assisi outside the former Franciscan monastery. 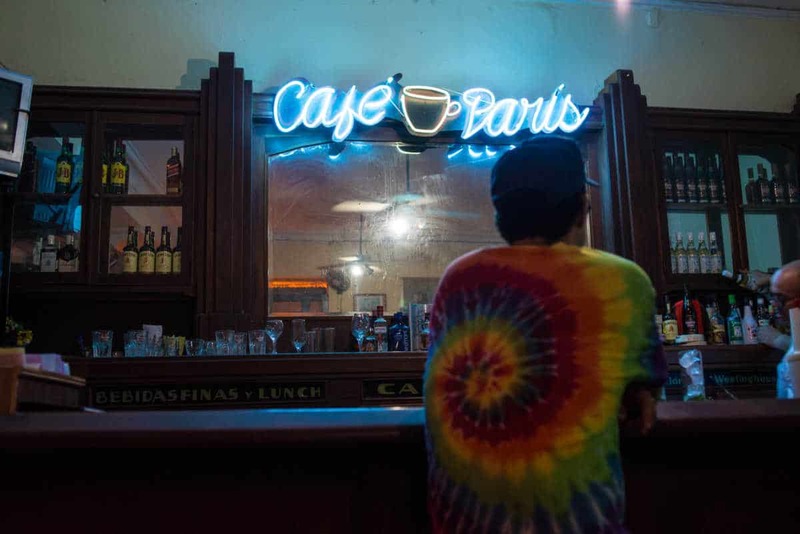 It’s been closed for a long time, and is being renovated and will reopen when things tend to happen in Cuba–mañana. 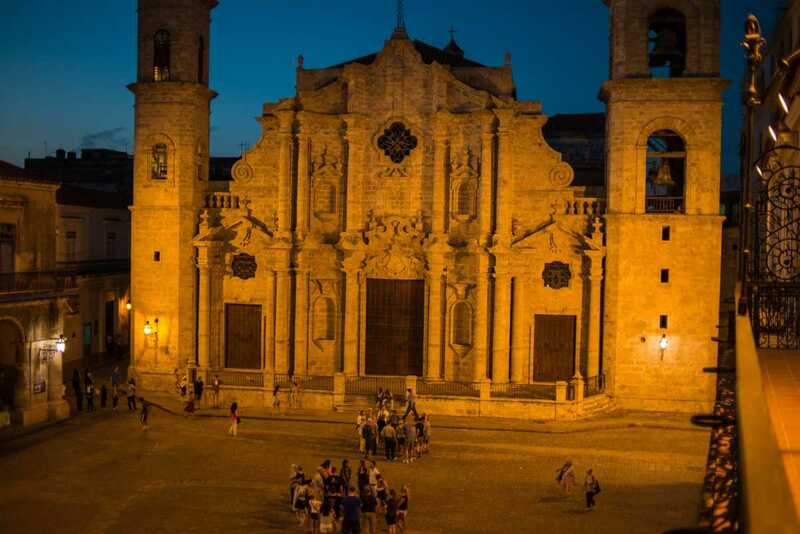 Unfortunately, the Cathedral of Havana is open very rarely. And we never seemed to get there when it was. It does look nice at night, though, when the cold stone façade is lit by warm light, making it seem inviting even if the doors are locked tight. The beautifully restored National Theater is especially vibrant at night. There was a dance concert that night, but unfortunately, it was sold out. There’s always a 1950s American car taxi to take you home. And a friendly cab driver, too. Never mind what his hat says. But, I do find it funny that it uses the Spanish polite form to make that suggestion about your mother. 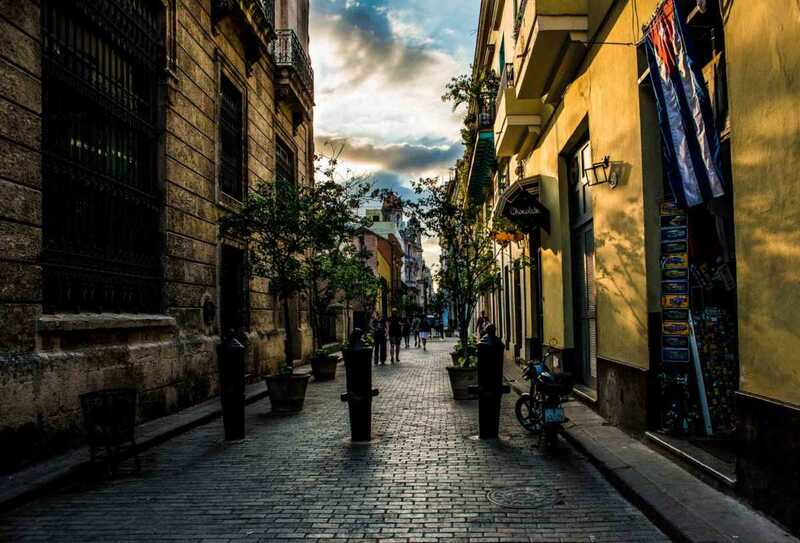 Okay, your photos make us want to sip mojitos in a Hemingway-frequented bar in Havana! 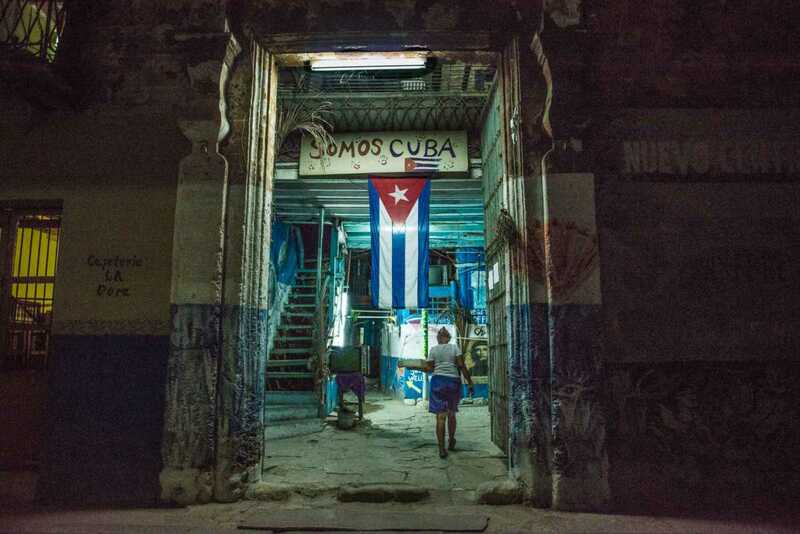 We’re Canadian — and it would be so easy for us to go to Cuba. But somehow, we’ve just not made the trip there yet. Some day! Being Canadian is no excuse! Go. It’s great, and you won’t have to apologize for your government, as we had to do repeatedly. Also, Canadian money is not subject to the 10 percent penalty when you change it, like US money is. Wonderful photos. 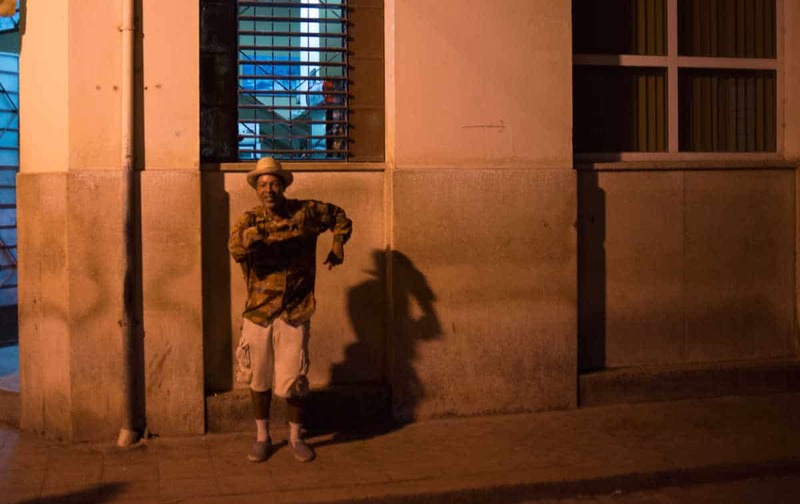 I love the one of the guy dancing in the street as that is so reminiscent of what we saw everywhere we went in Cuba. 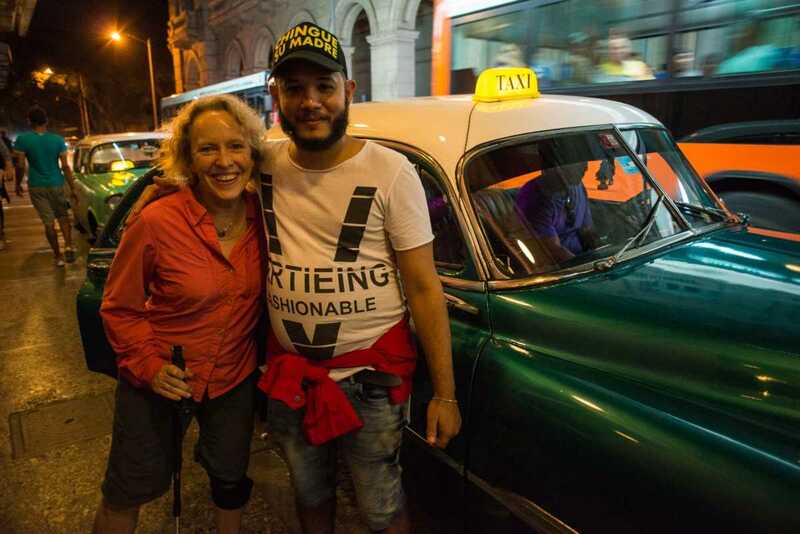 It’s been a very long while since I was in Havana. Would love to go back!